Home World Affairs SpaceX carries out first commercial launch with Falcon Heavy rocket. SpaceX carries out first commercial launch with Falcon Heavy rocket. 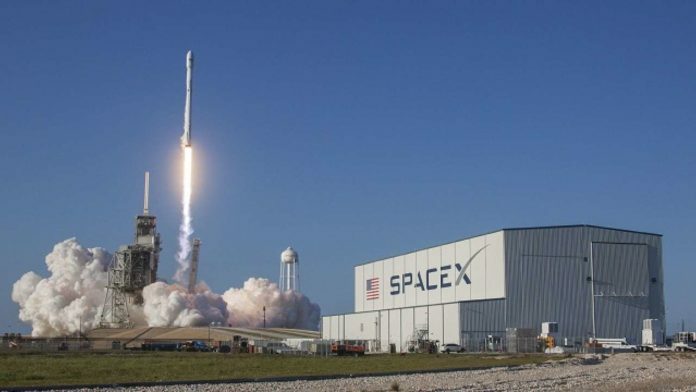 In United States, SpaceX has carried out its first commercial launch with its Falcon Heavy rocket tasked with placing a Saudi satellite in orbit. The bright white rocket rose with a mighty roar and spewed thick gray smoke on the ground as it made its way up into clear blue skies over Cape Canaveral, Florida last night.SpaceX said the rocket exerts 5.1 million pounds of thrust – that of more than a dozen jetliners. The rocket is to carry a Saudi Arabian satellite operated by Arabsat, a year after sending founder Elon Musk’s red Tesla roadster into orbit as a test. The Falcon Heavy had been scheduled to lift off from the Kennedy Space Center on Wednesday but was delayed because of fierce winds in the upper atmosphere.